Continuing along in Blogging through the Alphabet, talking about teens, and this week has been a struggle. Nothing works for a topic. Maybe it was because we were getting ready for a visit from my parents. Maybe it was because it is so hot, and driving my prone-to-overheating van isn't fun. 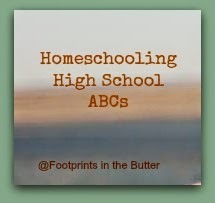 So I'm breaking away from the strict homeschooling high school subject, and typing up a slightly different post. Back when my kids were all small, and I was trying so hard to keep up with things... dishes, trash, clean a bathroom once in awhile, and oh, yeah... three meals a day, I used to fantasize about the kids being older and truly being able to help. I have to say, that has been a mixed bag. Some things, I just don't even think about anymore. Well, not too often, anyway. They get the trash taken care of without a lot of prompting, dishes get done with a bit of prompting, the kitchen is swept semi-regularly, and their bathroom is cleaned some of the time. The kids usually make breakfast, frequently make lunch, and sometimes they do dinner too. Somehow, though, it just seems that there is so much more that needs to happen now, and with high school loads, I feel guilty for making them do too much. Theoretically, that frees my older kids up to take on more complex tasks and it frees them up to spend more time on their schoolwork. That is important. In practice, all three teens have at least one basic, no-brainer job. One sweeps the kitchen floor daily. One does a one-minute wipedown in their bathroom. One takes care of trash. And my little two are pretty equal in ability, so just because the 8 year old CAN do dishes, it doesn't mean she does all the dishes. The 10 year old has dish duty as well. The teens wash pans and knives. The little two share vacuuming duties. The teens each have a "once in a while" job to do each week too. That might be cleaning the ceiling fan, or it might mean moving a sofa and vacuuming underneath it. It works great, when I am paying attention and making sure people are following through. In the interest of full disclosure, I'm not always real good at that. The visit from my parents reminded me of that. We worked to do things like clear off the island in the kitchen, and I remember how nice it is to work in the kitchen when I have all kinds of counter space. My Homeschooling High School point this week? I guess it is just that it is good to strike a balance, so that your teens are helping your house to be a home, yet not overloading them either. I'd love to know what works for you. Because I am always needing a new idea. My next post might be I is for iPads (and other technology) ... or maybe, like the past couple weeks, I'll be writing one post and another will force itself out. Marcy is posting a word study, and this week is H is for Honor. It's a good one. There are a few dozen other amazing H posts linked up too. Go check some out!